I never can predict when Hubs is going to say something blog-worthy, but, well, this happened while we were watching Game of Thrones this week. You’re welcome. Jim: You know, I wouldn’t mind working for those White Walkers. Katie: You mean the ice monsters that control an army of the undead? Jim: Yeah. I mean, I wouldn’t be a mindless zombie or whatever, but maybe they need an accountant. Jim: Well, I see 5000 zombies over there and 5000 zombies over there. I can tell them how many wights they’ve got on hand at any given time. Katie: And when they find out you’re terrible at math? Jim: Oh that’s fine. They’ll just transfer me to research and development. Those glowing blue eyes didn’t just happen, you know. Katie: You are seriously so screwed when the dragons show up. Apparently my husband identifies with evil. Welp. At least I knew what I was getting into when I married him. Weirdo. I’m not sure how coherent this post is going to be, because I’m still trying to figure out how to get my jaw off the floor. I recently decided to put my Audible subscription on hold because Scribd is a better deal for my voracious audio book appetite at this time. However, before pulling the proverbial plug, I needed to use up one last credit. I checked my “I Want To Read This” list and hunted for something I could get on Audible that I couldn’t get on Scribd and VOILA! 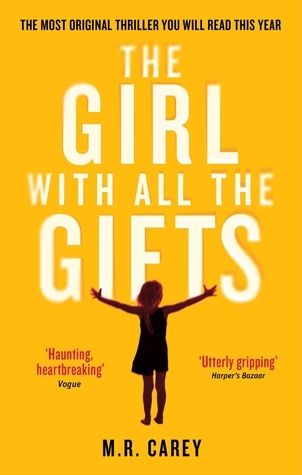 The Girl With All the Gifts by MR Carey seemed like a fabulous option. 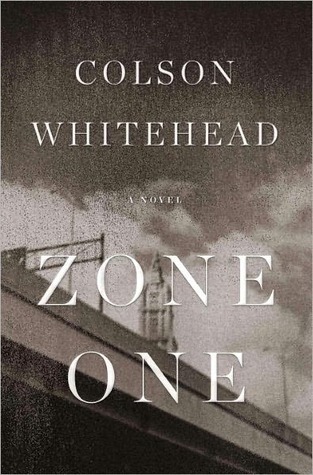 Remember a while back when I was talking about Zone One (review) and praising the fact that Colson Whitehead took a different approach to the zombie genre? The Girl With All the Gifts did that. Times a zillion. This book was SO GOOD, you guys. I was expecting to enjoy it, but egads it was amazing. 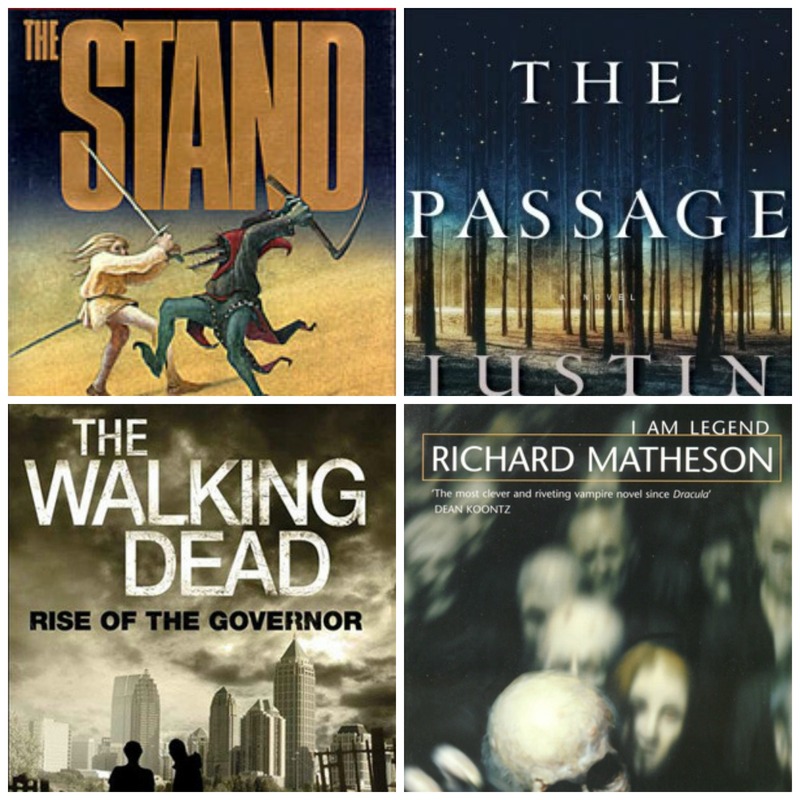 Elements of the book reminded me at times of The Passage by Justin Cronin (review) and I Am Legend by Richard Matheson (review) but it still maintained a level of originality that blew me away. Just pick up the book, dagnabit, words are failing me. Talk to me Bookworms! What was the last book you read that left you awestruck? Got a case of the Mondays? Perhaps you’re feeling a bit… zombie-like? You’re in luck, because today we’re going to talk about Colson Whitehead’s novel Zone One (yes, there are zombies!) As with any number of the books I read, I was recommended this book by the brilliant Sarah Says Read. That girl never steers me wrong. Zone One is set in the post zombie-apocalyptic world. The US government is a bit rag tag at this point, but the remaining population is pulling themselves up by the bootstraps and trying to take back some of their cities. Mark Spitz is on a team of sweepers tasked with clearing the zombiefied remnants out of Manhattan. In a rather novel approach to zombie trope, Whitehead focuses on the aftermath of the event rather than the gory horror of the apocalypse itself. (There still is some gore, though, so it will satisfy your blood lust.) What is more interesting to me is the psychological cost of survival. A MASSIVE portion of the remaining population suffers from a condition known as PASD (Post Apocalyptic Stress Disorder, natch.) How can your brain possibly reconcile having watched your zombified mother feast upon your father’s entrails? That’ll leave a scar, yo! I’ll admit that Whitehead’s prose was a little stodgy for my taste. It felt a little like he was trying to overcompensate for the subject matter of the novel by burying it in elaborate turns of phrase. Of course, I’m desperately plebeian when it comes to language, so take the criticism for what it’s worth. All in all, though, Zone One is definitely a book zombie fans should check out. I’ve never read any comics or graphic novels prior to this book. They’re all the rage these days, and I knew that I was missing out. I figured the best place to start was with a story I already loved, and I was RIGHT. I chewed through all 1100 some pages of this bad boy in record time. Granted, most of those pages were pictures with minimal text, but it makes me feel accomplished nonetheless. If you’ve been living under a rock, The Walking Dead takes place in the midst of a zombie apocalypse. Where did it come from? Nobody knows. All anybody knows is that zombies want to eat people, and that they can only be killed by destruction of the brain. Seriously. Dismembered heads are still pretty chompy, you’ve got to make sure you do damage to the gray matter. You’ve got the monster element plus the “holy crap there’s no electricity” element which all adds up to awesomeness. I’m typically a “the book is better than the movie/tv show” sort of gal, but I am seriously digging what they did with The Walking Dead. The show and the comics diverge significantly, which means that just when I think I know what’s about to happen, I’m surprised! Sometimes I liked a character on the show much better than in the comics (Carol, anyone?) or liked a character better in the comic than in the show (Comic Lori was way less obnoxious.) There are characters in the show that aren’t in the comics and vice versa. All in all, it’s just a good crazy zombie-tastic time. 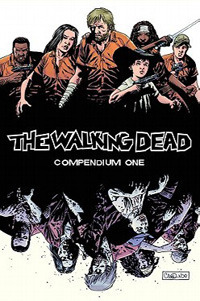 I know Compendium Two is going on my birthday list! Talk to me, Bookworms! Do you prefer book to screen adaptations to be perfectly faithful or are you okay with a a good amount of divergence? Some things just go together. Coffee and cream. Peanut butter and chocolate. Spaghetti and meatballs. Jane Austen and undead creatures. 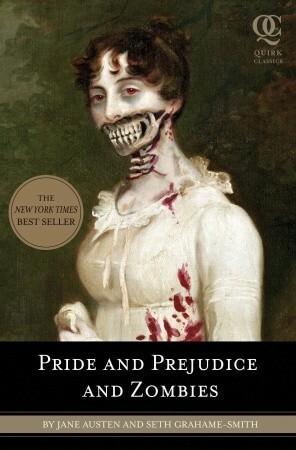 Yep, I recently enjoyed the audio book version of Pride and Prejudice and Zombies . It’s an odd little mash-up of Jane Austen’s classic Pride and Prejudice and Seth Grahame-Smith’s vision of how Austen’s England would have responded to a zombie apocalypse. The version I listened to (wahooooo library!) was the second release of the book. It included EXTRA “ultra-violent zombie mayhem.” Alright, alright. You know Pride and Prejudice . Now that zombies are introduced into genteel society, young ladies’ expected accomplishments go beyond the rigors of embroidery and fancy fingerwork on the pianoforte. It’s now fashionable to have your daughters trained in martial arts so that they can easily decapitate a few manky dreadfuls before tea. Nothing mucks up a nice country ball like an attack of the undead. Now, there are many out there who are probably outraged at the idea of a beloved classic getting such an irreverent treatment. It didn’t diminish my enjoyment of the original. In fact, I found it cheeky and fun. It was especially amusing to listen to gory zombie scenes read by the most proper of English accents. I happen to think that Ms. Austen would find this version of her novel innovative if nothing else. If you like Jane Austen, zombies, and a heavy dose of ridiculousness, Pride and Prejudice and Zombies is the book for you. Tell me something, Bookworms. How do you feel about this sort of classic re-imagining? Yay or nay? 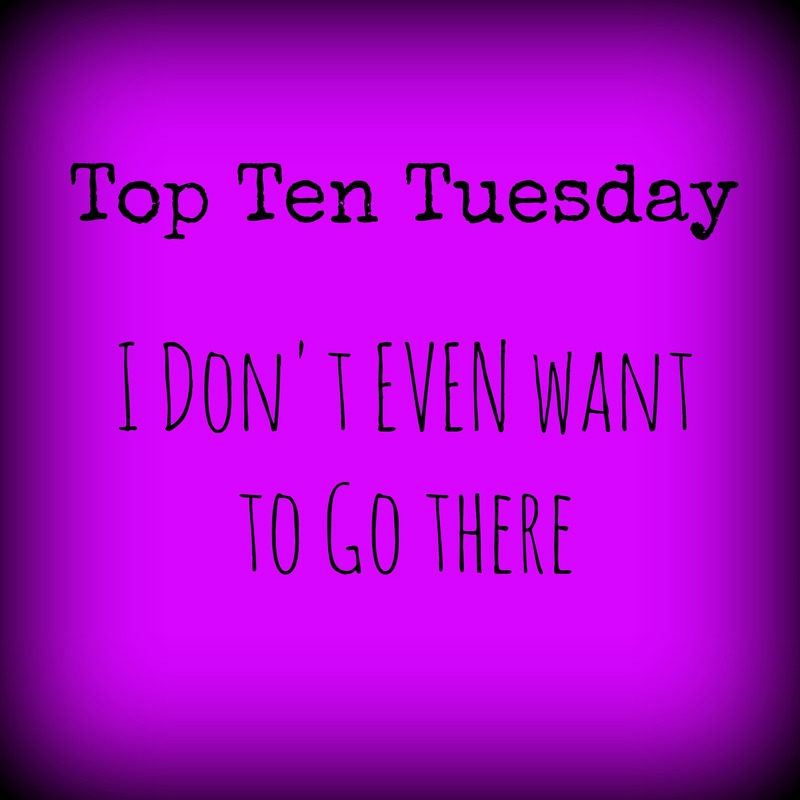 It’s Tuesday again, which is mind boggling, because seriously, where does the time go? 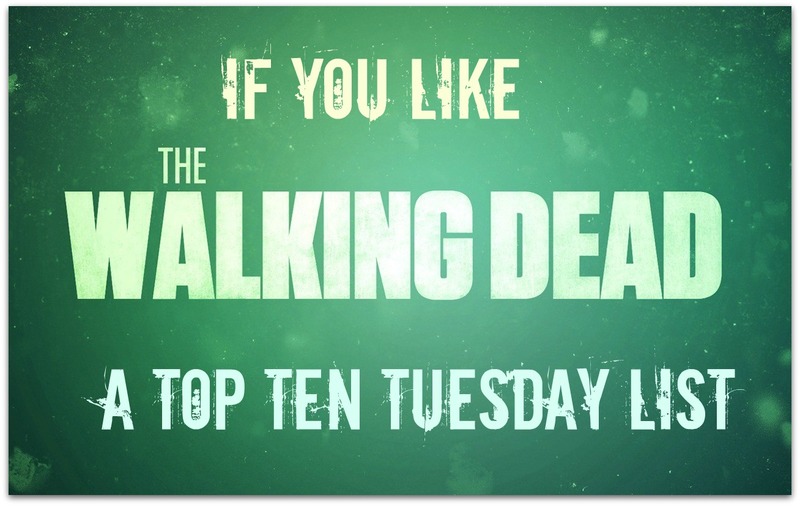 This week the ladies of The Broke and the Bookish have challenged us to make a list “for fans of.” IE, if you like a certain TV show, here’s a bunch of books you might dig… So OF COURSE I went with one of my favorite shows EVER, The Walking Dead . Because ZOMBIES! 1. 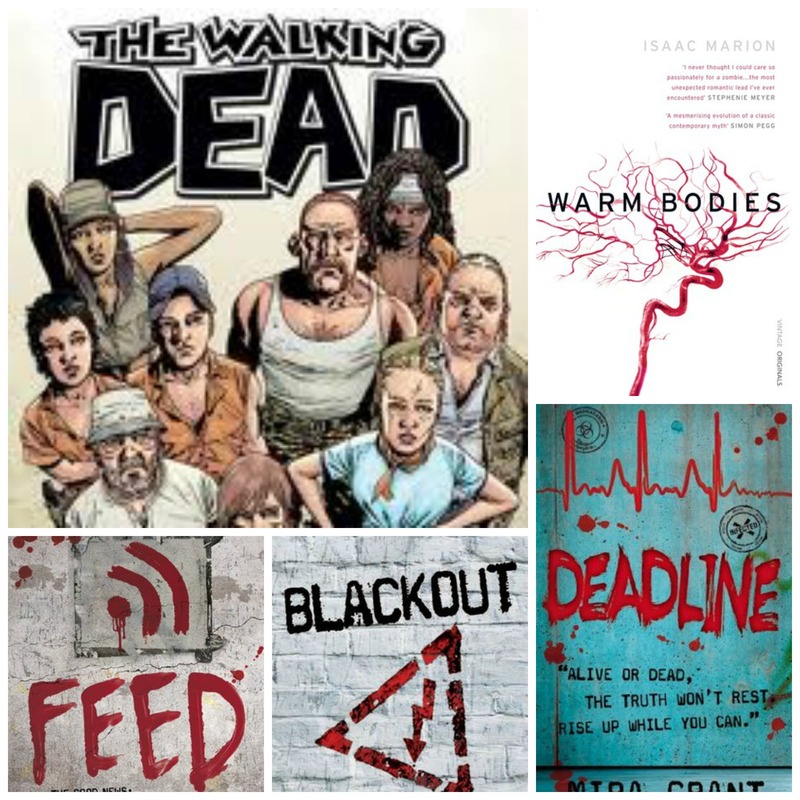 The Walking Dead Comics by Robert Kirkman: It is 100 percent hypocritical of me to list this as I’ve not read them myself. BUT. I want to. And I hope to. And you should join me. 2. The Newsflesh Trilogy by Mira Grant: I loved these sooooo much! 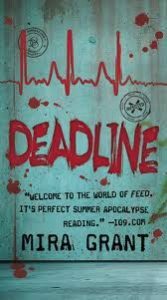 Feed (review), Blackout (review), and Deadline (review) presented such a creative take on the whole zombie genre that I was hooked from the very beginning. 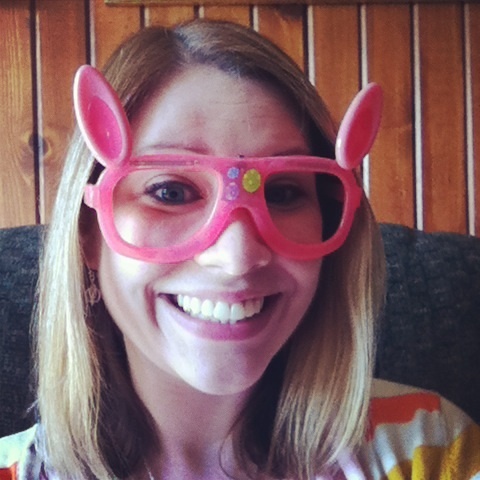 Plus, all the internet and bloggy goodness made it extra super appealing. And science. SCIENCE. Just read them, okay? 3. Warm Bodies by Isaac Marion: I may have spoken too soon when I talked about a unique take on zombie lore, because Warm Bodies (review) is definitely off the zombie shuffled path. It’s a light-hearted, quirky little romance starring a dead guy. Seriously so much fun. Check it out! There you have it. ZOMBIES a la Katie. Do any of you Bookworms like The Walking Dead, and how much do you hate the long hiatus?! 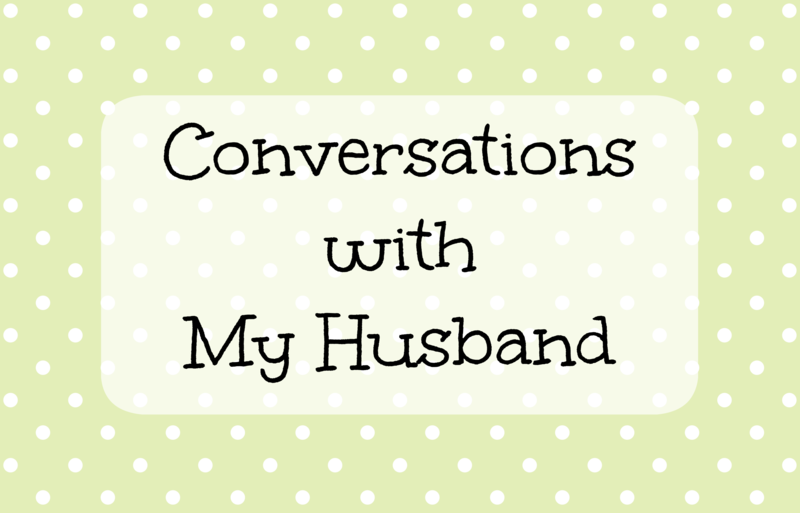 It’s Tuesday and the ladies of The Broke and the Bookish have a fabulous topic for us today. They’ve asked us to list out societies we’d never want to live in and/or characters we’d never want to trade places with. Dystopias and post-apocalyptic novels are some of my favorite books, so I’m really excited! Let’s get to listing, shall we? 1. The Handmaid’s Tale by Margaret Atwood (my review): Hmmmm, let’s think. Why wouldn’t I want to live in a world where women are enslaved and used strictly to breed children? Maybe I picked the husband I wanted and have no desire to be reassigned by a terrifying religious government. Maybe it’s because if I’m going to grow a kid, I’d like to keep it. Maybe it’s because they no longer allow women to read?! Plus, that whole winged hat thing is a bad look for me. 2. The Hunger Games by Suzanne Collins: Children fighting to the death. For sport. Even if you don’t get chosen yourself, your kid someday might. Let’s talk about the worst thing ever. I think this is pretty much it. 3. The Passage by Justin Cronin (my review): I had some serious anxiety reading about the people living in the compound. Nearly 100 years since the vampire apocalypse, this fledgling society lives on a wing and a prayer… And the rapidly deteriorating battery powered lights that keep them from being eaten every night. 4. The Road by Cormac McCarthy (my review): We never find out exactly what happened to the world, but nothing grows, everything is coated in ash, and there are bands of cannibals roaming the countryside. It’s so freaking BLEAK, and I don’t want to go there ever, ever, ever! 5. Never Let Me Go by Kazuo Ishiguro: How would you like to grow up knowing that you were a clone being used for spare parts? Don’t get too attached to those kidneys now, kids. 6. World War Z by Max Brooks (my review): I had SO MANY NIGHTMARES reading this book. It’s a fantastic look at what would happen to the world during a zombie apocalypse. 7. The Stand by Stephen King (my review): As if surviving the deadliest strain of the flu EVER and trying to find other survivors weren’t enough of a challenge, the friggin devil incarnate is out there causing trouble? Yep, I could live my life without going through THAT madness. 8. Brave New World by Aldous Huxley (my review): Oh, I won’t lie. There are days when a dose of Soma sounds like a grand idea… But I’m not big on societally mandated orgies. Sorry y’all. 9. 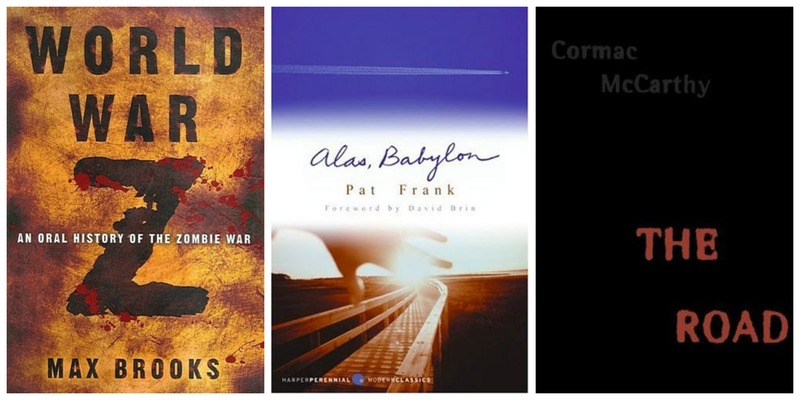 Alas, Babylon by Pat Frank (my review): Nuclear War is THE WORST. I don’t want to live through that. 10. A Game of Thrones by George RR Martin: I don’t know what’s the worst thing about living in this world. The brutal “justice” meted out by wicked royals? There’s no telling when winter will end? The friggin zombie things living behind the ice wall? Heck, Martin is so fond of killing off characters I’d probably already be dead. Westeros, I shan’t be visiting! Alright Bookworms, it’s your turn! What books would you NOT want to be sucked into??? I’m looking forward to trick-or-treaters tonight! It’s supposed to rain, so perhaps we won’t reach our record of 300 ghosts and goblins, but it should be fun regardless. Anyway, today also marks the end of my all-scary-all-the-time reading binge. I’m celebrating by discussing the final installment of Mira Grant’s Newsflesh trilogy, Blackout. As I mentioned when we discussed Deadline, it’s impossible to discuss the final installment of a trilogy without spoiling things at least a little bit… Particularly in the case of these books. So, here we go again. SPOILER ALERT! IF YOU HAVEN’T READ THE FIRST TWO BOOKS READ AT YOUR OWN RISK! SPOILERS ARE INEVITABLE. WARNING WARNING WARNING! I WILL NOT TAKE RESPONSIBILITY IF YOU DON’T LISTEN TO MY SHOUTY CAPITALS! When we left the crew, Shaun was holed up at Dr. Abbey’s lab- the renegade mad scientist studying Kellis-Amberlee. He’s recently been proven to be immune to zombie disease. Too bad he’s still grieving George so heavily that he doesn’t want to poke dead things with sticks. But wait… What’s this? The plot THICKENS. It’s a veritable STEW right now! So the CDC is even MORE evil than we’d thought, because Deadline ends with George WAKING UP! WTF? It turns out, George has been cloned by the CDC. Holy crap on a cracker! The girl has been friggin resurrected! Unfortunately, she’s also being held prisoner, and can’t get in touch with anybody to let them know she’s alive…Luckily, all evil organizations have their weaknesses, and the CDC has been infiltrated by another organization. George is confused about who to trust, and all she wants is to get back to Shaun. Excitement and drama and conspiracies and zombies abound! And then… Mira Grant threw me a plot twist I wasn’t expecting. I mean, it was sort of alluded to, when I look back, but I’m still not sure I’m not bothered by it. I’m slowly coming to terms… But… Yeeeeeeeeeah… Still- I cannot get enough Mira Grant and I can’t rave enough about these books. Egads, just read them already! Read them! Best decision I made all Halloween season. 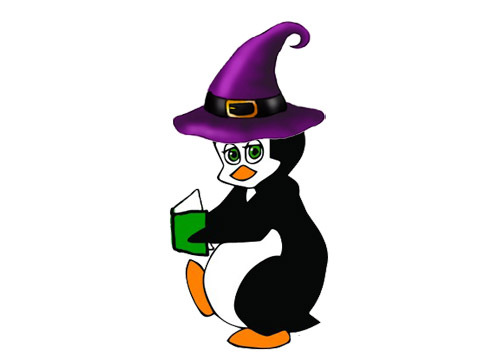 So Bookworms, who’s excited about Halloween? Who has mentally prepared for the idea that a zombie apocalypse might just occur during trick-or-treating?! 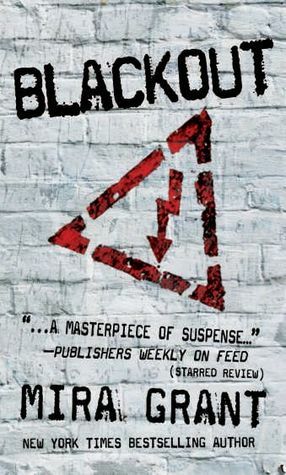 If you’re interested in purchasing a copy of Blackout by Mira Grant, copies are available on Book Depository. If you order using this link, I will receive a small commission, which will most likely be invested into more books. Help me help you, y’all. As you may recall from last week, I have gotten crazy super into the Newsflesh series by Mira Grant. Now, because this is a series, it’s damn near impossible to avoid spoiling book 1 in order to talk about book 2. So. If you’re concerned about having Feed spoiled for you (and I highly recommend reading it, so proceed with caution) this is your official SPOILER ALERT. SPOILERS AHEAD! SO MANY SPOILERS! FOR THE LOVE OF GOD, SPOILERS! IF YOU KEEP READING AT THIS POINT AND SEE SOMETHING YOU WISH YOU HADN’T, I TAKE NO RESPONSIBILITY, BECAUSE OF THE MANY, MANY BOLD CAPITAL LETTERS I JUST SCREAMED OUT. 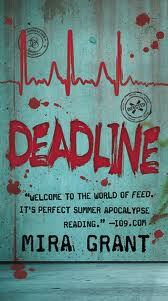 Deadline by Mira Grant picks up where Feed left off. The beloved leader of After the End Times is gone, leaving a grieving brother and a hole in the site’s infrastructure. The remaining team members have picked up the slack, but nothing is quite the same. Shaun has taken a distinct turn toward the mentally unstable, as he regularly converses with his dear departed sister Georgia. (I talk to myself verbally all the time… It’s just that there isn’t a voice in my head answering me… Which puts me firmly in the “eccentric” camp… Or so I like to tell myself.) All is shuffling along until one day Dr. Kelly Connolly shows up at After the End Times seeking asylum. You remember Dr. Connolly- she was working at the CDC when Dr. Wynn got George, Shaun, and Rick out of that little assassination attempt on the highway? What EXACTLY a CDC doctor could need from a rag tag team of journalists and self proclaimed “zombie pokers” is unclear, and they don’t have the time o find out since shortly after the Doc arrives, a full fledged zombie outbreak gets in the way of storytime. As it turns out, the conspiracy George and Shaun were chasing down in Feed didn’t end with the death of the Vice Presidential candidate/Batman Villain. Oh yeah. And Rick? The journalist the team picked up from that stripper lady’s campaign? He’s totes the VEEP now. So. That’s not weird or anything. But you know. When the dead are walking, all bets are off. Anywho. The team goes traipsing around in dangerous territory, always one step ahead of being eaten by zombies… Well. Not everyone is ALWAYS one step ahead of the zombies, but if I told you everything, you wouldn’t want to read this. And believe you me, you WANT to read this. All the things I loved from Feed still apply to Deadline. The conversational tone of conversation the bloggers employ. The cheeky pop culture references (Becks, head Irwin, has a blog called Charming Not Sincere. I’m choosing to believe that’s a clear reference from Into the Woods because musical theater tickles me.) The zombie lore and the conspiracies. It’s downright delicious. Has anybody else out there been bitten by zombie fever? I feel like The Walking Dead was my gateway drug and now I’m kind of obsessed. Anybody noticed the prevalence of zombie costumes on their Facebook pages? Let’s talk about the undead, Bookworms! I’ve been having an absolute blast reading all these scary books lately. I kept hearing great things about the Newsflesh trilogy by Mira Grant- I simply couldn’t stop myself from picking up a copy of Feed. The Zombie Apocalypse? Been there, done that. This book takes place 30 years post outbreak. Apparently the virus that causes people to rise from the dead was caused by an interaction between two genetically engineered viruses: one that cured cancer, and one that cured the common cold. Everybody has the virus in their system, but it only goes into amplification (read: zombification) when you’re bitten by a zombie… Or die of something else. 1. The Pop Culture References: George is the new Jennifer. I was positively tickled when it was revealed that an entire generation of children were named in honor of George Romero, undisputed king of the zombie film. Apparently Night of the Living Dead became an incredibly useful field guide. I can only assume the spelling of “Shaun” was in reference to Simon Pegg’s hilarious zombie masterpiece, Shaun of the Dead. And Buffy? She downright OWNS that her nickname is after the iconic and only Vampire Slayer. Also, the thrill seeking dangerous reporter types are referred to as “Irwins.” I can only assume this is a nod at the late great Crocodile Hunter. What? Le Kattoo likes Halloween as much as the next penguin. 3. Realism: I happen to think that any mass contagion (influenza, smallpox, zombie-virus) would certainly pose a big problem to humanity. HOWEVER. I find it harder to believe that in an age of kevlar, body armor, and advanced weaponry, that the entire world’s infrastructure would crumble. I think the isolation, extensive blood testing, and attempts to prevent the spread of contagion are a more likely scenario… Though perhaps that’s just wishful thinking. In this world I could just stay in my house, order in groceries and mood stabilizers, and avoid anything that might eat me. Let’s talk about GERMS! Anybody out there gotten their flu shot yet? Anybody already been sick this season? Anybody want to give out their recipe for the world’s best hot toddie so we can all be prepared when the inevitable sniffles hit this winter? Talk to me, Worms!